The following preferences can be set using the Plug-in Development > API Baselines preference page. An API baseline defines the state you want to compare your development workspace bundles against for the purposes of binary compatibility, bundle version numbers, and @since tags. 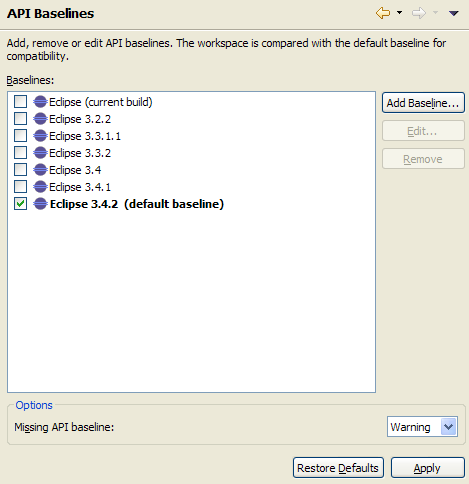 For example, if you are developing bundles for Eclipse 3.4, you could use Eclipse 3.3 as your baseline. Add Baseline... Allows you to add a new API baseline. Edit... Allows you to edit a selected API baseline. Remove Allows you to remove the selected API baseline(s).